8 Kurta Mistakes You Are Probably Making Right Now! We sure do love our LBD’s, and distressed denims, and shirt dresses, but there are some days when western wear just doesn't cut it. The comfort of a cotton kurta is a welcome break from the fitted jeans and oh-I-can't-breathe tops. Paired with leggings, or a roomy, breezy patiala, the kurta is the sartorial equivalent of comfort food! You’d think, how wrong can one go with a kurta? Its literally the easiest, most straightforward thing to wear, right? Well no! We’ve seen one too many ladies sporting kurtas that have made us wince. And just so that you don’t make the same mistakes, we’ve put down a bunch of non-negotiable no-no’s for you to keep in mind. Pay heed, peeps! Unless you’ve been working out pretty seriously, and have legs in incredibly good shape (who are you? ), you would be better off avoiding short kurtas (trust us!) with stretch leggings. It only accentuates your curves in the wrong way, and does not make for a very flattering outfit. Stop. NOW. Please! Ladies, if you have a tendency to sweat too much, select natural fabrics like cottons, voiles and linens that breathe. Avoid colours that make the sweat patches under your arms stand out like neon signs. And stay miles away from synthetic fabrics. Lining peeking out from under the hem of your kurta is a strict no-no. We’re definitely going to report you to the fashion police for this one! Don’t say you weren’t warned! We’re the strongest advocates of Indian wear in the workplace. There’s seriously nothing as elegant as a crisp, well draped sari in the boardroom, or a well cut kurta in the office. But be occasion appropriate. Leave the embroidered and sequined anarkalis for weddings, and opt for straight or A-line kurtas for work. Be mindful of the necklines - plunging necklines do not look professional, and are definitely distracting. Just because you’re not in a bandage dress, doesn’t mean you ignore your innerwear! Stick with seamless bras for casual wear. Good quality shapewear will tuck in your tummy and smoothen out your love handles for a smoother silhouette. If your kurta has heavy embellishments, wear a push-up bra instead. The weight of the fabric tends to make your twins look like they're on a trip down south. Dahling, yes, we know you’re after a movie star fit, and darts at the bust and back are just what you need to give your kurta the right shape. But the darts at the front are best left to the the movies of the ’70s. Unless you want it to be the centre of attention! We love the Indian wear selections Westside, Global Desi, Biba, Shopper’s Stop, W, Pantaloons and the likes, bring out season after season. You get value for money, contemporary designs, and wash and wear fabrics. All good! But sometimes the fit isn’t what it should be. Particularly if you’ve got wider hips, the shoulders and chest tend to sag. Buying an ill-fitted kurta is definitely a bad idea. Make sure you get it altered, or better get one stitched. 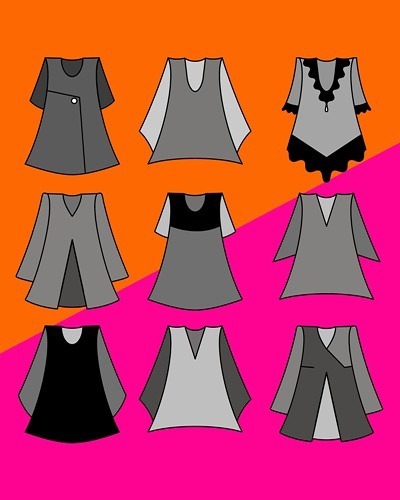 GIFs: Giphy MUST-READ: #RealGirlStyle: The Best Kurtas for Every Body Type! MUST-READ: #RealGirlStyle: 8 Types of Kurtas Every Woman Should Own!